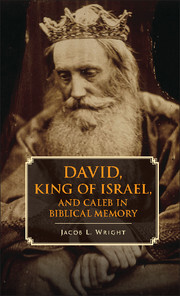 Wright, Jacob L. David, King of Israel, and Caleb in Biblical Memory. New York, NY: Cambridge University Press, 2014, pp. 271, $29.99, paperback. Jacob L. Wright teaches Hebrew Bible and Jewish studies at Emory University. He has also conducted research on war commemoration. Wright proposes a fascinating thesis, namely that a major influence on the evolution of the Hebrew Bible was what he terms ‘war commemoration’. He argues that this phenomenon can be found in many cultures, both ancient and modern, and is used to serve a number of distinct purposes. In particular, the way in which key protagonists in a battle are remembered will shape both the cultural attitude towards those individuals, and the extent to which their descendants are viewed as worthy members of the community. David and Caleb are identified as prime examples of these warriors. Wright subscribes to a form of the supplementary hypothesis (the current form of the biblical text stems from an original base text which was then supplemented by subsequent texts in successive stages), and suggests that at different stages in the development of the Hebrew Bible the authors/editors had differing agendas and used ‘war commemoration’ to serve the contemporary need. This accounts for apparent unevenness, especially in the characterization of David. After introducing his thesis, Wright argues that the earliest stories about David (History of David’s Rise) depict him as ‘a cunning warlord who wields his private army’ to establish the kingdom of Judah (p. 50). He was forced into such a career because, as the eighth son, he stood no chance of inheriting land, and so needed an alternative way to secure his own future (p.38-9). The HDR was later combined with a separate narrative of Saul’s rule over the neighboring kingdom of Israel and a new body of material was composed to create a unified narrative explaining how David came to be rightful ruler over both Israel and Judah. Different war stories were introduced at this stage, presenting various communities as loyal to either Saul or David (chs. 4&5). This material would speak into issues of belonging for those communities in the subsequent history of Judah. At a later stage in the composition of the text, the authors were concerned with the interplay between the nation (the people) and the state (the monarchy). This concern was likely post-exilic as the nation wrestled with the question of how it could survive without the monarchy. War commemoration was employed once again, as stories were introduced into the text, often using individual warriors to exhibit and critique different approaches to this matter (chs. 6&7). The book concludes with a consideration of the complexities around Caleb. Wright argues that the Calebites were an elite clan within Judah (p. 174) who needed to fight for their survival as a distinct grouping in the context of various social-demographic forces. They came under pressure first from the Judahite state, as the Davidic kings moved into their territory, most notably Hebron (p. 209). Much later, in the Persian period, they again needed to assert themselves as the Edomites laid claim to their territory (p. 216). The Calebites maintained their identity by creating memories of their ancestor as a Judahite warrior of the finest character. Wright is to be commended for offering a novel and creative solution to the complexity of the David narratives. His thesis, that through the evolution of the text, different editors used war commemoration to serve their different contemporary agendas, offers a plausible explanation for the variety of attitudes towards David found in the Hebrew Bible. He writes with an engaging style which draws comfortably on a wide range of different disciplines (history, art, literature, archaeology). However, there are a number of weaknesses in the argument. First, and foremost, his hypothesis is that war commemoration was used in the composition of the Hebrew Scriptures to serve a variety of sociological agendas. It is unfortunate, therefore, that the examples of known war commemoration which he identifies to support this claim are not directly equivalent to the writings of the Hebrew Bible. This kind of war commemoration is not an obvious phenomenon in the Ancient Near East (p. 26), and its use in other cultures tends to employ a different medium (a monument, rather than historiography). Furthermore, Wright does not appear to provide examples of an author creating memories long after the event, so as to serve a contemporary need. Moreover, the Hebrew narrator is known for providing only minimal information about the nation’s skirmishes. He seems far less interested in detailed military accounts than might be expected if he was engaged in ‘war commemoration’, and far more concerned to interpret the military history through a theological lens. This fact need not be devastating for Wright’s thesis, but it requires more attention than he gives it. These multiple gaps in Wright’s argument make his hypothesis significantly less compelling than he acknowledges. A second weakness in Wright’s argument concerns his diachronic approach. Wright claims to have identified different stages in the composition of the text, through observing awkwardnesses, disharmonies and contradictions. These different stages are characterized by different priorities and concerns on the part of the author/editor. This is typical fare for a source-critical approach. This approach, however, is always vulnerable to the criticism of being more subjective than is perhaps acknowledged. When Wright identifies different contemporary pressures which led to the creation of new ‘war memories’ he would do well to acknowledge that these contexts are generally hypothetical and the product of his assumptions about the evolution of the text. Even when he tries to establish, for example, that Keilah, as a border town, was ‘pulled to and fro’ in its loyalties to different kingdoms (p.54-56), the archaeological evidence he cites is from a different time period, and possibly a different settlement, than the one in question. Moreover, recent literary approaches have demonstrated that supposed tensions in the text, so often the justification for source-critical theories, may actually be intentional poetic devices which would not concern an ancient hearer. It would be appropriate, therefore, for Wright to express his assertions about the growth of the text with more circumspection. This is especially the case when Wright writes in a style which would be accessible to the non-expert who may not have the wider knowledge to test his argument. Despite the weaknesses identified above, the student of biblical and theological studies will be able to benefit from this book, especially if they have some familiarity with source-critical approaches to the Deuteronomistic History. The argument is stimulating in helping the reader consider the various social-demographic pressures affecting the first readers of the text. The reader will engage with some of the more obscure characters in the David narrative, and, whilst they may not accept all the conclusions Wright offers, they will have a richer grasp of the role these individuals and communities would have had in the nation of Israel. That said, it is significant that Wright’s approach is almost entirely sociological rather than theological. This may affect the relevance of the book to some students.